Andrew Kellaway scored his first try for Saints last Saturday - and immediately set his sights on many more. The Australian centre came off the bench after just 12 minutes of the game at Ashton Gate, and he wasted no time in making an impact. Kellaway tracked Tom Collins superbly and his former Randwick team-mate put the try on a plate for the summer signing. It was a tidy finish in the corner as Saints' former Waratahs back delivered on just his second first-team appearance. It wasn't his first try in Northampton colours though, as he also scored on his one and only appearance for the Wanderers, at Sale. And Kellaway looks like he has all the tools to become a key player for Chris Boyd's team this season. "It was nice for me to get one - and hopefully I can get many more!," said the affable 22-year-old. "It was hot and dry and there were plenty of points. I'm sure it was good for the crowd to watch. "A couple of little errors and penalties kept Bristol in the game and we need to address that, but it's an easy fix for us. "When you're trying to play an expansive brand of footy, errors will come with that. It's part of it when you're throwing the ball around and having a run-first kind of mindset. "There were a lot of tired bodies out there so a lot of holes." The game was compared to a basketball match by boss Boyd as the tries went back and forth with Saints eventually beating Bristol 45-40. 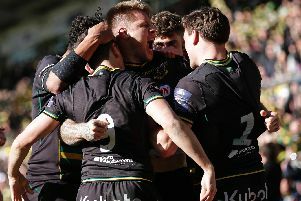 It was a first home defeat for the newly-promoted team, as Saints picked up their first away win of the season. "It's a tough place to go and win," Kellaway said. "I've not been in England long but it was pretty clear during the week that it would be tough to go to Bristol and win. "To come away with five points is not to be underestimated." Like Kellaway, Taqele Naiyaravoro also registered his first Saints score last weekend. The powerhouse wing, who has also joined Saints from the Waratahs, was unstoppable in attack, brushing off Bristol players at will. And when asked how you stop Naiyaravoro, Kellaway laughed and said: "You don't. "It's a bit like a speed bump on the road - you just jump in front and hope for the best. "We'll be hoping he can do a bit more of that this year." In fact, Saints will be hoping for a bit more of that on Saturday. They face their local rivals, Leicester Tigers, in a huge Premiership game at Twickenham. It will be played in aid of former Waratahs and Saints centre Rob Horne, who Kellaway knows well. And the new Saints ace said: "It's going to be a huge game - it doesn't need any more talking. "It's clear what will be driving us and it's a derby match, so they've got just as much on the line. "If the rain stays away it will be an awesome spectacle."